We’re not exactly what you would call a “musical” family. But over the years, my husband and I have tried to include music in our daughters’ lives. Baby Mozart was bathtime music. We had toy musical instruments accessible. Raffi, nursery rhymes, Disney princess tunes and the like were played and sung on a regular basis. We have seen some musical theater performances. And now they’re (sigh) into their ‘tween music artists – downloading their music, and singing and dancing along to their songs. But one area we haven’t ventured into yet is actual music lessons. “It’s not too late!” said one of our local music teachers. In fact, it’s great to get started at any age – and the younger, the better. There are wonderful long-term benefits for who are consistently exposed to music and who also take formal music lessons. One of the greatest and probably the most obvious benefits of music is its relaxing effect. I suggested to my fourth grader, who was overwhelmed with the number of math problems she had for homework, to turn on some music while she does her math. She instantly found it helped – it relaxed her and put her into some kind of rhythm as she did one problem after another. In addition to acting as a pleasant, energizing accompaniment, music also serves as an important developmental tool. Young children who simply listen and sing to music can improve vocabulary development, speech enunciation, listening abilities and even memory. You may think that “The Wheels on the Bus” played 10 times in a row in the car is just your child trying to torture you, but it truly does serve an important purpose. Then beyond just listening to music, taking music lessons can be a great learning opportunity. Through musical education, kids not only acquire a skill they can enjoy through adulthood, but also gain advancements that spread beyond the music lesson itself. Formal music training seems to be strongly linked to better performance in non-musical skills, such as reading, mathematics and spatial intelligence. 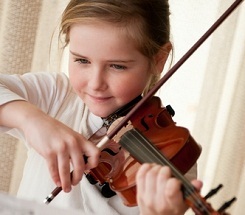 In fact, according to the National Association for Music Education, kids with a background involving musical instruction score higher on the SAT than their non-musically trained counterparts – actually, 56 points higher on the verbal portion and 39 points higher on the math portion of the test. In addition to the academic benefits, learning to play music is a great way for kids to express themselves and gain self-confidence. As they play the piano, for example, they will have an outlet for how they’re feeling – melancholy, happy, lively, angry. Then simply the act of being able to learn and play musical instrument, along with your support and encouragement, is incredibly satisfying and confidence-building. I know one of our early impediments to having our daughters take music lessons was the cost. One acquaintance warned us that we’d practically have to take a second mortgage out to afford them. Although this was a bit of an exaggeration, it can be costly, especially when you have more than one child. However, after some research and asking around, I found there are actually some affordable options. For example, our neighborhood school offers after-school violin lessons in which the violin is even supplied. Other reasonable options are group lessons as well as courses given through the city and at city recreation centers. While deciding on music lessons, also remember to help your child choose an instrument that fits their personality and interests. They’ll be more likely to stick with it if it’s something they truly enjoy. In addition to the actual music lessons, you can expose your child to a wide variety of music through local performances at schools, theaters and community centers. At home, from the radio or from CDs from the library, play a variety of music for your child. They can then learn about different cultures and earlier periods of time in history. And remember to simply enjoy music together – from playing a Baby Mozart CD during bathtime and listening to your child play an instrument to singing and dancing. We’ve found that music is just another terrific way to bring us closer as a family. So I try my best (not always successfully) to not make comments or contort my face when my daughters turn on their ‘tween tunes. I’ve even been known to hum or sing along from time to time.